It’s nearing the end of January, and time to do a resolution check-in. Aside from the obvious personal development goals (be more self-disciplined, manage my time better, be less judgmental about people’s Christmas cards, blah blah blah), getting in shape is omni-present on my to-do list. Why is it so hard to strike a balance between eating less with working out more? In December, it seemed like a perfectly good idea to pop pigs in blankets like they were M&Ms. If there was a way to keep them warm, I would have had them in bowls around the house. And while the wheels are already turning about how to make this happen next holiday season, I have to face reality. Those little pigs caught up with me. So while I wait for the resolutionists to make way for the regulars, I look to at-home workout alternatives. What will it be this year? I begin my research with the latest issue of Us Weekly. There’s a name that keeps popping up from week to week, so I Google it. Tracy Anderson, the trainer to Gwyneth and Madonna, has a series of workout DVDs and they get fantastic reviews. I learn that her approach involves strengthening accessory muscles. I love accessories! This could be a great fit. Her most current workout is called the Method, but it’s pretty pricey and is to be done over a series of months. I consider it for a minute, then remind myself of the P90X DVDs I already own, and how after 30 days of failed pull-ups they were shelved and renamed P30X. I decide I can’t commit to the Method, so opt instead to order up her single DVD Mat workout. I feel proud that I didn’t cave and see this as a self-discipline win. Later, while my husband makes a return at Best Buy, I wander to the fitness section. As I peruse the aisle, envisioning my super-fit New-Year self, he appears out of nowhere to find me holding a Bob Harper jump rope. He doesn’t roll his eyes, ask what I’m thinking, or even remind me of the unused workout paraphernalia currently in the basement. Instead, he takes to his iPhone and price checks it for me, confirming that if I were to make the purchase it would be a decent deal. On one hand, he is supportive of whatever it is I want to do. On the other, however, it’s likely he remembers that I am the one who helped him carry his Power Tower to the curb before one of our many moves. Yes, he’s had his own foray into at-home fitness regimes. This is not my husband, but it could have been if he kept his Power Tower. 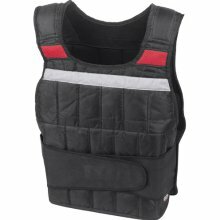 My personal favorite was my weighted vest. It looked like a life preserver, and within it were several pockets, each containing a 2 lb weight. I could add as much weight as I wanted, in increments, up to 40 lbs. What was I thinking? I’m pretty sure I burned more calories putting it in the donate box than actually using it. I can’t even picture myself wearing this. We leave Best Buy without the jump rope but I purchase 3lbs dumbbells, which are required to do the Tracy Anderson workout. Even I can’t help rolling my eyes at these little purple weights. I’m beginning to wonder if my husband and I have a fitness equipment co-dependency. A few days later my DVD arrives. Before attempting it, I watch it most of the way though. She gives no direction, but I’m confident that between those 2 years of ballet and my high school cheerleading career I’ll be able to pick this up. Immediately, however, Tracy kind of annoys me. She’s wearing her hair down and styled. Strike 1. I’m fairly certain she’s working out in front of a mirror, and she’s dropping Blue Steel the whole time. Strike 2. The workout is an hour long, and she advises that to get results, it must be done 6 times each week, along with a substantial amount of cardio and a restrictive diet. Strike 3. I decide toreject Tracy and her workout and see this as a time management win. Maybe I should just go to the gym.